Truth is, you do not need lots of fancy equipment or expensive filtration systems to keep your pond crystal clear and your fish and other critters thriving. You can have the pond of your dreams by learning just a little bit about your pond’s water chemistry and the natural pond care alternatives you can use to replace those toxic algaecides or expensive UV sterilizers you might currently be using to maintain your pond. To help you GO NATURAL, we went to our network of pond professionals and koi dealers to give us their best advice for people looking to pull the plug on their UV and quit their long time reliance on algaecide solutions. Not all pond care methods are created equal. In fact, some are downright destructive! It’s quite possible that your diligent pond care techniques may actually be harming your environment instead of helping. Are you struggling with pond maintenance way more than you expected? Is crystal clear water more of an anomaly than the norm? Do you find yourself wondering if the investment in electrical costs is worth it? Has your UV light ever gone down and caused a toxic mess? Do you think algaecides are not harming your local environment? If you answered yes to any of the questions, you’re probably frustrated and hungry for a quick fix! Don’t worry, mastering the science and art of clear healthy water IS EASY! A well balanced pond starts with good husbandry and a little work! Learning how to carefully optimize the environment you are cultivating will set you up for long-term success. It might actually be easier than you think… and we’re willing to bet that the solution you seek may only be a shift in your approach. Quick question, are you using copper algaecides or UV lights to “control” algae? You won’t see this in the sales ads, Copper algaecides & UV lights are quick-fix band aids and won’t provide lasting results. These pond care solutions work at the superficial level, neither actually address water chemistry or the fundamental issues which lead to poor water quality. Both can actually harm your pond’s eco-system more than you might imagine. Warning! Chemicals create a weak ecosystem… one that may be harming your fish! Think about it this way… when you put bleach in your washing machine you get clean whites… add a tad too much and you can burn the material. Add just one drop in the wrong place and you can ruin a load of colors or, god-forbid, you get it in your eyes. You wouldn’t take a bath in a tub of bleach right? Why should your pond’s fish have to live in such harsh and unnatural conditions? Don’t let anyone fool you, natural pond maintenance is a sure path to consistent, crystal clear water… and, it’s just not that hard to do. Boom. Going natural IS a long term solution. It’s easy AND it works. Think about it for a moment, nature knows, she’s been building ecosystems for all of time. The logic is simple. Healthy water systems have balance through a strong chemical makeup. The stronger the body of water, the more balanced it is, the better able it is to fight off the things that pull it out of equilibrium. Man-made chemicals create a dependency that actually weakens the water system. When you “go natural” you work with the ecosystem to establish the baseline required to harmonize water chemistry. Keep in mind that timing for seeing results depends on the current balance in your water. We are happy to report that some users experience great improvements over night. Generally, it can take over a month to fully cycle your pond’s water. If your pond has been pumped with algaecides for a long time, it will take a little longer to rebuild the ecosystem. We encourage our pond community to remember, good things often take a little time and attention. It’s worth the wait! We’re here to encourage you to stop using toxic algaecides! If clear sparkly water is not enough, keep in mind that natural pond care delivers big by cultivating healthy water AND a healthy food chain. To “heal” your pond’s water once and for all, you’ll need to nip core issues in the bud. 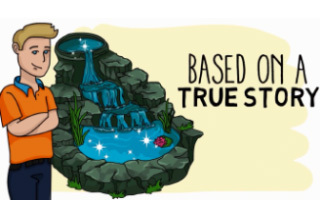 So, you may be wondering how to get the process started in your pond…. By increasing the dissolved oxygen (DO) in your pond you are able to improve the enzyme activity of bacteria to trigger an increase in DO and the quality of the aquatic food chain. Your pond is alive with plants, fish, insects, and birds that rely on oxygen rich water to thrive. They expect a bio filter that removes material waste and a well circulated anaerobic system. Oxygen is a necessary element to all forms of life and especially for good water quality. Oxygen gets into water by diffusion from the surrounding air, by aeration (rapid movement), and as a waste product of photosynthesis. You are sterilizing your pond water and working against the natural cycle when you use UV lights, algaecides, and conduct large water changes. To create a strong anaerobic cycle, you need strong bacteria paired with essential nutrients to encourage diatom growth, which photosynthesize and increase the amount of DO in your pond’s water column. This promotes aerobic bacteria which double every 20 minutes. Diatoms, bacteria, and zooplankton work together as nature’s filter to consume the extra waste in your pond! Nualgi Ponds is specifically designed to increase diatom growth and kickstart your pond’s food chain. When used with beneficial bacteria like Microbe-Lift PBL, pond owners across the world are reporting incredible (and lasting) improvements in the aquatic food chain that continue to get better every year. Natural pond care benefits the local environment, your animals, and any children who play in or around the water. Your fish and plants are counting on your good choices! Give it a shot and let the evidence speak for itself… your pond water quality will get better each season! By using nature to consume the bad bacteria you will have a pond that flourishes just like you always wanted. Let us help you make the switch to natural pond care. Go natural with our power combo! Combine Nualgi Ponds and Microbe PBL to create a well cycling pond environment. One that is safe for fish, frogs, snails, dogs, cats, humans and… the added bonus, it will have less mosquitoes due to better water quality! Order the combo package that has helped countless pond owners to achieve crystal clear and healthy water. Nualgi Ponds + Microbe PBL is one of the most common success stories we hear and have partnered up to bring to you this special offer. Still not convinced to go natural with Nualgi? It may seem like we are making a lot of claims… but we are serious and confident because our users consistently report how they are able to turn off their UV lights and stop using algaecides. “Here is one great example of testing I did. It is the only photo documented test I performed. The photos are only of the before and after. This is a test on new pond syndrome, new water. But still, I have not witnessed such a fast elimination of green water without algaecide.” – Christian S.
“We are a professional landscaping & water garden company. We do maintenance on about 20 ponds each month. 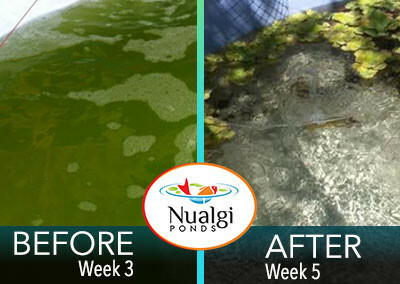 I sell Nualgi because it is a product I believe in & our clients love that it keeps their ponds clean & clear.” – Linda W.
“My fish have done a complete 180 since using this product with no UV light (that I was using for 2 years prior)! They look better, feel better… And I also just took another pump for air out because this product helps keeping oxygen in the water!” – Roger D.
Afraid to make the switch? If you are feeling nervous about making the switch to natural pond care – you can get our expert support along the way! We are here to help answer any of your questions about going natural and hope you will take this message seriously. With us to support you the entire way through the process…so what are you waiting for?